I tried to find the song being performed but had no luck , however check out these girls singing mango time. I think you’ll get the idea of the song, they did a great job. Ride im dung an no tap a pass- ride him (the donkey) down without stopping at the pasture ..ha ha. Mango season is definitely my favorite season. On weekends like this, nothing gives me more joy than to climb trees and pick fruits. I’m a country girl at heart. Now that I live in the city , I really consider myself lucky to have a Mango tree at my front door, regardless of the constant race with the neighbors to see who picks them first. Today I was reminiscing about my childhood in rural Jamaica, there was always an abundance of fruit trees in my yard. Before washing my face in the mornings, I could be found raiding a tree, be it mango, plum, guava, tamarind or naseberry. It’s the thing I miss the most about life in the country. It irks me every time I have to pay for any form of fruit here in the city because in my mind fruits are supposed to be free. If you didn’t have your own tree your neighbor would send you fruits. Julie in all her glory. There are various species of mangoes in Jamaica , the song lists four of them,Turpentine, Robin, Number 11 and Hairy skin. From memory and experience I can add to the list , East Indian, Bombay, Haden, Tommy Atkins, Stringy aka Common Mango and last but not least St. Julian aka Julie Mango , which is pictured above. 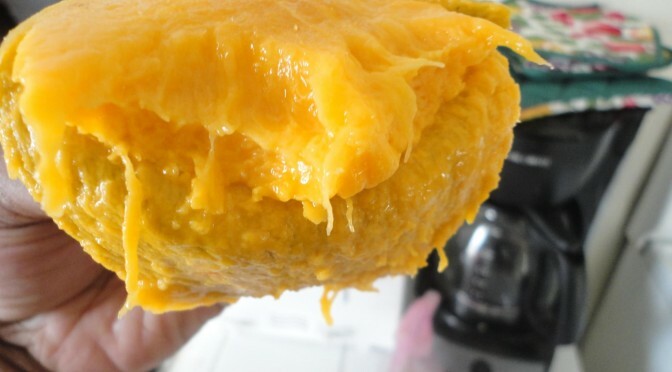 Judging from my teeth marks would you have guessed that its my favorite kind of mango ? This one is especially for my neighbors. Do not attempt to climb or stone a person’s mango tree without permission. Do not use a long stick to fish them over a wall. Do not climb the tree at night and bite every mango until you find the ripe ones, we know rats and bird bites different from human. Mangoes are best peeled with your teeth rather than fingers or a knife unless its the Julie, East Indian and Bombay which is best eaten with a spoon. It is totally acceptable to wrap green mangoes in newspaper until they are ripe, a thing I have to do on a regular basis because of my above mentioned neighbors inconsideration of my mango needs. Green Mangoes are best had with sugar but if salt and hot pepper are your preferences then do you. If you are of Indian descent it is only right that you learn to make chutney , so you can share with your friends that lack such culinary talents (like me) . Green mango with salt is THE BEST! Can’t wait to get back for some mangoes!!!!! 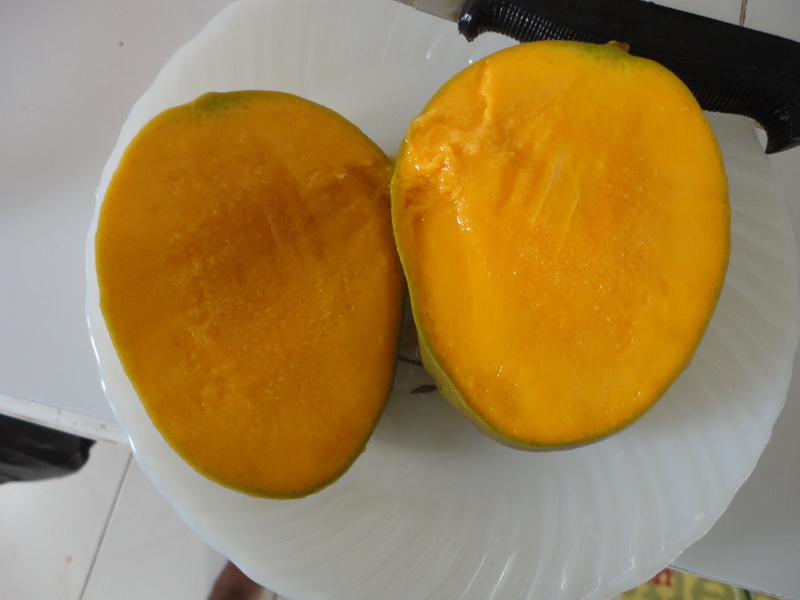 Now, I do understand while I do not always like the mango you can buy here in most stores. Probably this are not the tasty ones! 🙂 i guess not many people know here that there are so many different kind of mango. At least I know there is one kind that is called “ready to eat” and this ones I LIKE eating! 🙂 they are much sweeter than the others you can get here nearly all year long.